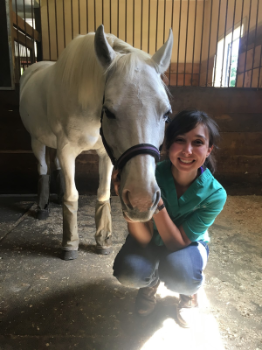 Dr. Alexa Wright will be joining our veterinary team for her internship year from June 2018 –June 2019. Dr. Wright grew up in Massachusetts showing hunters and jumpers on her now retired horses. She obtained her undergraduate degree in Neuroscience from the University of Michigan (Go Blue! ), and then earned her DVM from Cornell University College of Veterinary Medicine. Her areas of interest are dentistry, ambulatory practice, and emergency medicine. In her spare time, Dr. Wright enjoys spending time with her family, taking care of her horses, and painting. Pictured here is her beloved Welsh pony, Louise.